Israel's UN Ambassador criticizes UN Human Rights Council's decision to establish a Commission of Inquiry to examine Israeli "war crimes". 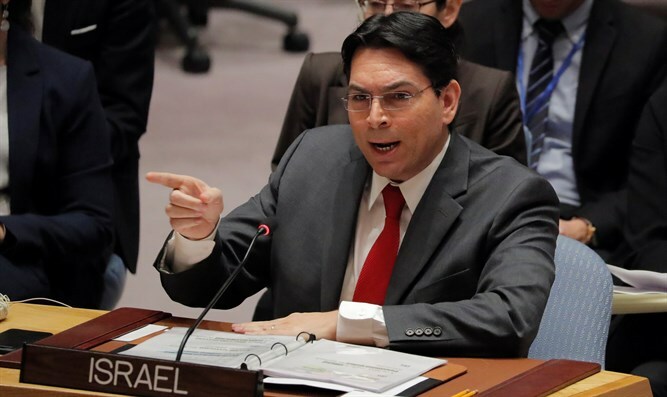 Israel's Ambassador to the United Nations, Danny Danon, responded on Friday to the UN Human Rights Council's (UNHRC) decision to establish a Commission of Inquiry to examine possible war crimes committed by Israel during the recent confrontations on the Gaza border. "The fact that this shameful decision was made even after Hamas officials admitted that the vast majority of those killed were terrorists proves, once again, that nothing can separate this Council from its hatred of Israel. The day this Council investigates the war crimes of Hamas is the day it can be called the Human Rights Council," said Danon. The Israeli Foreign Ministry, meanwhile, condemned the "hypocrisy and absurdity" of the UN Human Rights Council after the vote. "Israel totally rejects the resolution of the UN Human Rights Council, that once again has proven itself to be a body made up of a built-in anti-Israeli majority, guided by hypocrisy and absurdity," the Israeli foreign ministry said in a statement. The statement added that the results of the inquiry were a "foregone conclusion inherent in the wording of the resolution". "It is clear to all that the purpose of the commission is not to arrive at the truth, but rather to impair Israel's right to self-defense, and to demonize the Jewish state," it continued. The resolution was approved by a vote of 29-2, with 14 abstentions, following a day-long special session in Geneva. The U.S. and Australia were the only two countries that voted against the resolution. Germany, Hungary, Japan, the Republic of Korea, Croatia, Ethiopia, Georgia, Kenya, Panama, Rwanda, Switzerland, Togo, and Britain abstained. Ukraine and Mongolia were not present at the time of voting. Justice Minister Ayelet Shaked blasted the decision to establish the Commission, calling the UNHRC "hypocritical" and "pro-terror" and said it supported radical Islam. The UNHRC "could care less about human rights," said Shaked. "The Commission seldom criticizes the ongoing genocide in Syria, and ignores the Iranian threat against an entire country, and the cruel way in which Hamas uses women and children for its political goals," she accused. Instead, said Shaked, the Commission "The Commission of Hypocrisy elects to attack Israel – the only democracy in the Middle East and one of the most moral countries in the world, in its attitude toward life and human rights."